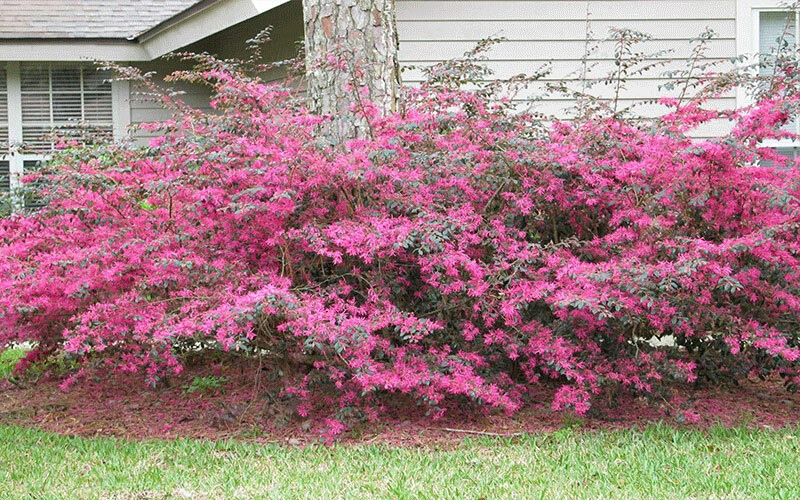 This evergreen bushy shrub has fragrant, spider-like pink flowers borne in cymes in late winter or early spring. 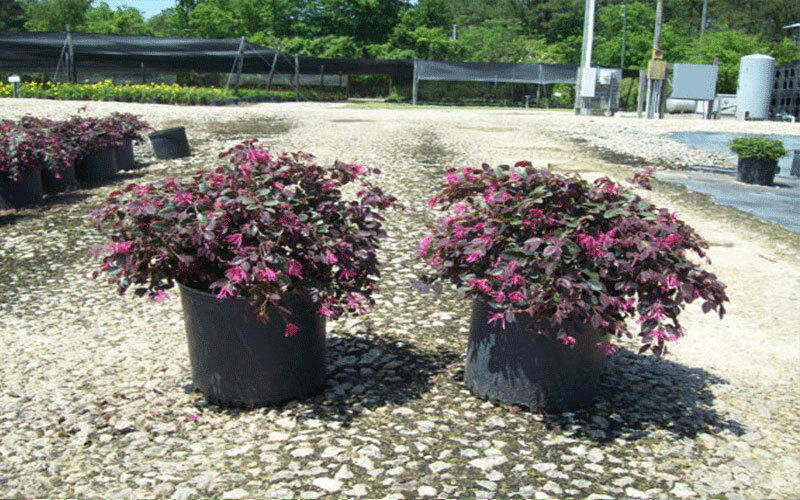 The oval leaves are burgundy colored.Ruby Loropetalum is covered in masses of hot pink / fuschia colored blooms that are very reminiscent of tassels or pom poms. Blooms are most prevalent in early spring, and again in mid fall but occasional bloom outbursts will be seen here & there throughout the entire growing season. Addition of organic matter to the soil, or regular feeding will maximize both bloom intensity, as well as foliage color. Plant in spring, summer, or fall, spacing plants 6 feet apart or closer if you want a hedge line. Dig a hole only as deep as the root ball and 2 to 3 times as wide. If your soil is in very poor condition, amend the soil you've removed from the hole with a small amount of compost. Otherwise don't amend it at all. Carefully remove the plant from the container and set it in the hole. Fill the hole half full with soil, then water it well to settle the soil and eliminate air pockets. Let the water drain, then fill the remainder of hole with soil and water thoroughly. Terrific as hedge shrubs or privacy plants, these native Florida plants can grow to about 8 feet if you let them though most of the time they're kept trimmed to around 4 feet. 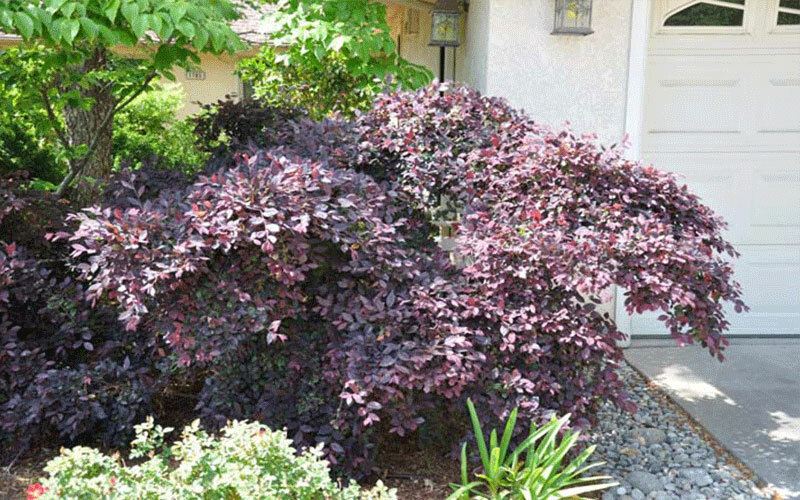 This is an easy-care plant that can be kept more manicured for a formal look or left to grow in its naturally pretty rounded shape in a casual landscape style. 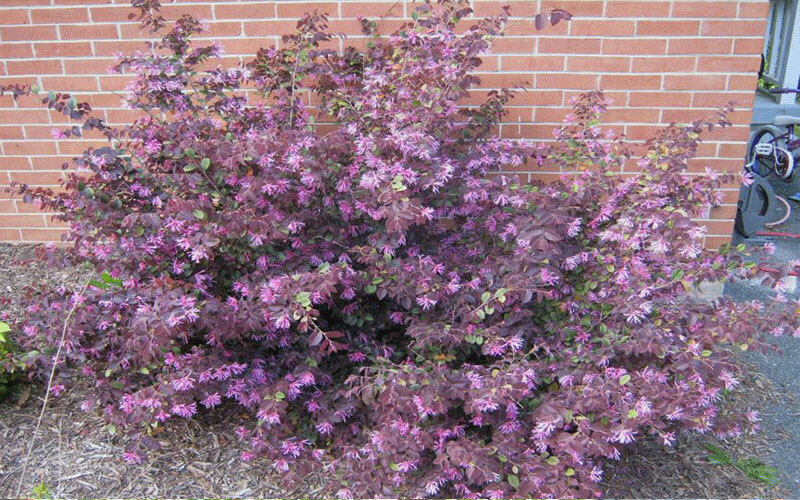 This shrub is a moderate grower that you can keep trimmed about 3 feet when young, and 4 to 6 feet when the plant is mature.